Château Puyfromage is situated in a privileged location on the highest hillsides of the Gironde region adjacent to Saint-Emilion. Between the valleys of the Dordogne and Isle rivers at fifty kilometers north-east of Bordeaux. 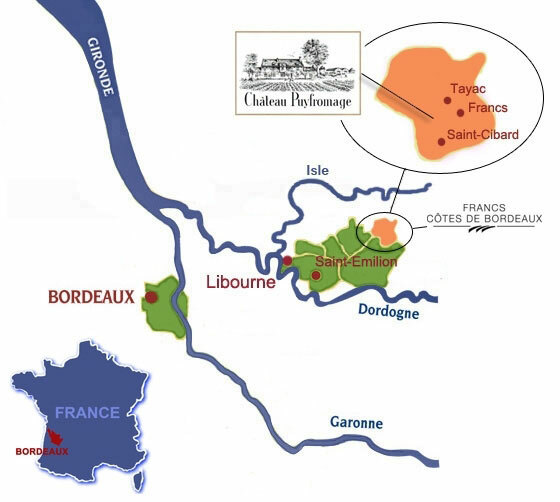 Francs Côtes de Bordeaux appelation with a surface area of 500 hectares, it is composed of 3 regions Francs, Saint-Cibard and Tayac. The appellation is the smallest and the most westerly or all Bordeaux ACs. Its official recognition as an AC by the INAO with its current geographical borders dates back to 1967.